Data is not boring, especially if you are interested in establishing historical truth. In the past year, Americans have been exposed to an immense amount of data about age, health, economic status, and opinions. A number we hear a lot about these days is 77,7440–the votes in Pennsylvania, Michigan, and Wisconsin that helped Donald Trump win the electoral vote even though Hillary Clinton won the popular vote by about 2.8 million votes. With increasing levels of partisan skepticism influencing news consumers and creators alike, outlets like FiveThirtyEight and Vox can offer refreshingly empirical perspectives to those who enjoy studying history. 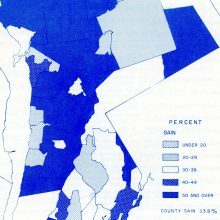 Tags: census, data, data journalism, data vizualization, demographics, Employment, human resources, local-history, religion, statistics, white plains collection, and white plains history.